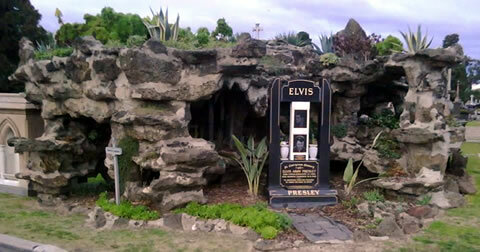 An unexpected memorial found in Melbourne Cemetery is the Elvis Presley Memorial Garden. The memorial was commissioned by the President of the Elvis Presley Fan Club of Australia in November 1977. It is believed to be the only one of it's type in Australia and draws 1,000s of visitors each year on the anniversary of the King's death (16th August 1977). TO WHOM YOU GAVE SO MUCH"
Elvis may have left the building but his memory lives on in some crazy places. Take his shrine at Melbourne General Cemetery, one of the grandest plots in the graveyard, no less. Glossy black, like his famed quiff, The King's tombstone stands tall in a lovingly landscaped stone grotto, surrounded by ferns and succulents. Hand-etched portraits and fake flowers crank up the kitsch, while plush toys and roses are often left in his honour (especially around his birthday and the anniversary of his death). Not bad for a performer who never even toured here! Commissioned by Victoria's Elvis Presley fan club and unveiled by Australia's own rock'n'roll rebel Johnny O'Keefe, this memorial is strangely touching - and touchingly strange.